How long before we hear the latest installment of the gun advocates argument that school faculty members should carry weapons in school? The old debate whether arming teachers would make school safer has been raised since the deplorable 1999 Columbine shooting and trotted out after every tragic school shooting. 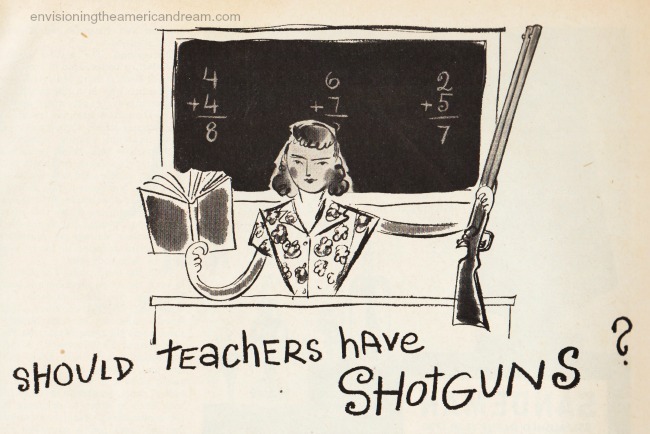 With that logic, than answering the question posed by this vintage illustration above is a big resounding “yes” teacher s should carry guns in the classroom even shotguns. Of course this cartoon question taken from a 1948 advertisement for sound proofing ceiling tiles was posed in a more innocent time. The notion of a gun totin’ teacher was so ludicrous it was meant to elicit a guffaw more than a raised eyebrow. 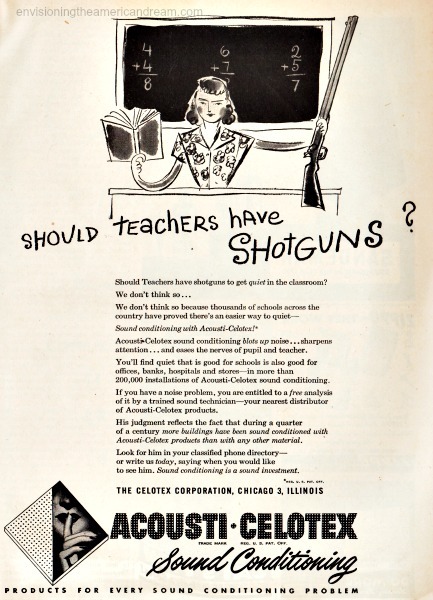 When this ad ran, long before mass shootings became the norm in America the biggest threat a teacher worried about apparently was noise disturbance in the classroom. Sound conditioning with Acousti- Celotex. Sound conditioning blots up noise …sharpens attention and …eases the nerves of pupils and teacher. Despite what some assert, advocating for more guns to protect against mass school shootings, guns will not ease the nerves of pupils and teachers. This debate distracts from the essential discussion on ways to curb violence in school before it begins. Nope, more guns don’t add up to more safety in the classroom. © Sally Edelstein and Envisioning The American Dream, 2015. Thing is the Second Amendment explicit says, “A well regulated Militia, being necessary to the security of a free State, the right of the people to keep and bear Arms, shall not be infringed.” Seems that’s quite clear. You have to be in a militia to have a firearm. But does the Supreme Court talk about a well-regulated militia. No. I say draft all those extremist gun tooter into a well-regulated militia, then send them over to Syria to clean things up. The thing is all those who yell and scream about their right to carry firearms into churches and schools and bars wouldn’t be happy about getting drafted. That certainly is one solution! Being an elementary & middle-school teacher in Texas this post hits home both professionally AND personally. Professionally, I pursued education and state-certification in the core subjects. I did NOT pursue military or SWAT training, much less the necessary crisis-training and psychology of confronting a gun-weilding mad-person, despite having a background in Psych/A&D crisis-management! If I wanted to pursue lethal credentials, I would have joined the police or armed services. On a minor(?) note, public school teachers are already NOT PAID well enough to do the jobs they’re certified for and asked to do anyway! For that matter, neither are police officers. On another note, from my years in psychiatric/A&D inpatient assessments & admissions, packing a weapon is REALLY not conducive for calm negotiations, let alone de-escalating an unstable human. Twice in my professional experience in the Psych/A&D field, I (solo) de-esculated & dearmed a rifle-weilding man threating our hospital, then months later a psychotically unstable husband over his wife’s infidelity… he held a loaded Gloch to my temple for 3-5 minutes until I calmed him down & disarmed him as well. Approach is paramount! Many times (most times? 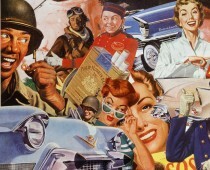 ), weapons only escalate a crisis. But this is strictly dealing with the acute threat: the pathological gunman/gunwoman. What about comprehensive safety for students and staff? Texas, as well as other states, are allowing school districts, principals, and teachers the choice to carry concealed weapons on campus & inside the classroom. Like you Sally, I feel this initiative is at the least horribly misguided, and at most no different than keeping lit candles inside powder-keg rooms. Asinine. On a personal level, my sister is a relapsing addict and psych patient (dual-diagnosis) of 35+ years. If she isn’t in jail/prison for numerous social & legal warrants, she can ONLY stay admitted in a psych/A&D hospital for 5-7 days for detox… no more. After, she is released (again) to repeat the entire cycle, as has been the case for the last 20-years. A few times, she HAS been arrested for public intoxication & disorderly conduct. Thank society’s lucky stars she’s never carried a gun nor used one. However, that is often NOT the case with thousands of other free-roaming psych/A&D candidates untreated/unwanted on the streets…pissed-off at the world and “system.” My personal point and experience? Thank you so much for offering your personal insights to this story. Arming teachers is a wild risk for everyone involved. What we should be focusing on is repairing the often woefully inadequate, overcrowded, underfunded mental health care systems that are in place that tragically allow too many to fall through the cracks. My husband who is an attorney who works as a public defender, witnesses this on a daily basis, would most certainly attest to the fact you make that adding guns to the unstable mix is the wrong solution. In total agreement Sally, with your husband (I’m sure) as well as you. And I didn’t even touch on the massive taxpayer-expenditures for court costs, legal fees, law enforcement resources, etc, etc, all perpetually spent for those unwanted/unadmitted psych patients on the streets (coping on their own!) like my sister. My Mom has now gotten to the point where she much prefers my sister being in jail/prison than on the streets! Many thousands/millions of parents feel this way! Its a tragic problem, one shared by so many.